Stanozolol is a synthetic steroid that has anabolic and androgenic properties. Dromostanolone propionate is a steroid ester and a 3-oxo-5alpha-steroid. It has a role as an antineoplastic agent. It derives from a metholone. 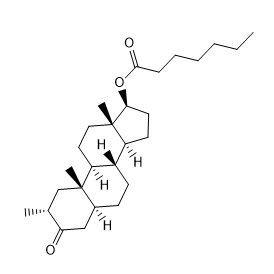 Methenolone is a 3-hydroxy steroid. It has a role as an androgen. Furazabol is a steroid. It derives from a hydride of an estrane. Trenbolone is an androgen and anabolic steroid (AAS) of the nandrolone group. Trenbolone Cyclohexylmethylcarbonate is a steroid ester.